As I complete this post, it’s completely dark outside and it’s only 5 o’clock in the afternoon. Today is 14 December, and most people I come across think that it will continue to get dark earlier and earlier in the afternoons until 21 December, the shortest day of the year (at least for those of us in the northern hemisphere). This, however, is not the case. The evenings in fact start to draw out a week or so before December 21, so it is already getting lighter in the evenings, although it does not start to get lighter in the mornings until early in the new year. The table below shows the sunrise and sunset times for London in December 2014. 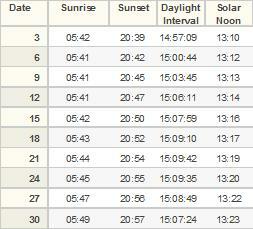 In the table the daylight interval column shows the number of hours, minutes and seconds between sunrise and sunset. 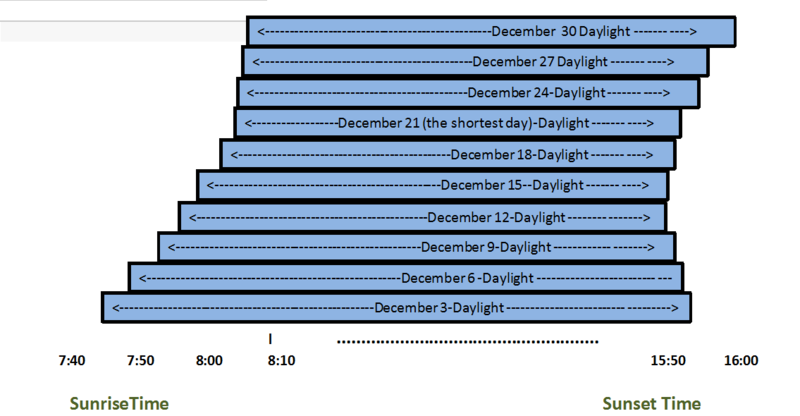 This clearly shows that December 21 has the shortest period of daylight. However, the time of sunrise continues to get later and later throughout the whole of December, whereas the time of sunset starts getting later after December 12. This is good news for Mrs Geek, who walks home from work in the dark at this time of year. The column in the table showing the solar noon gives the time of day that the Sun is at its highest in the sky or, to put it another way, the middle of the day at the mid-point between the times of sunrise and sunset. The table shows that, during December, the solar noon moves later and later by about 30 seconds each day. Why does the solar noon shift ? A solar day is not always exactly 24 hours. In fact, it is 24 hours only four times a year, and never in December. The definition of a solar day is the period of time between solar noon on one day and solar noon on the next day. It is at its shortest, around 23 hours 59 mins 38 seconds, in mid September and at its longest, around 24 hours 30 seconds around Christmas Day. The graph above shows how the length of a solar day differs from 24 hours. The y-axis shows the difference between the length of a solar day and 24 hours on a given date measured in seconds. So, for example, a value of 10 means a solar day is 24 hours 10 seconds long , 20 means a solar day is 24 hours 20 seconds long , -10 means a solar day is only 23 hours 59 minutes 50 seconds long. As you can imagine, it would be complete chaos if our clocks and watches had to cope with days of different lengths, so we use 24 hours, the average over the whole year, for all timekeeping purposes (See Note 1). So, as I mentioned before, the solar days in December are on average 24 hours and 30 seconds, while our clocks and watches are still assuming that each day is exactly 24 hours. This causes the day to shift about 30 seconds later each day, as shown in the diagram below. This explains why the evenings start drawing out before the shortest day, but it continues to get darker in the mornings until the new year. Before the invention of accurate clocks sundials were widely used to keep time. As the length of a solar day varies over the course of a year, the solar time, which is the time given by a sundial, will not be the same as the time measured by a clock which assumes that all days are exactly 24 hours long. Before the invention of accurate clocks in the 17th century because the variation is so small virtually everyone in the world, apart from a very small number of astronomers, would have been unaware of this. However, in the eighteenth and nineteenth century as mechanical clocks started to take over timekeeping from sundials, the difference between the time measured by an accurate clock which is called mean time and solar time became an issue for everyday life. Astronomers call this difference ‘the equation of time’. It was first calculated and measured by the British astronomer John Flamsteed (1646-1713) in 1673. Incidentally Flamsteed was appointed by the king as the first British Astronomer Royal in 1675, for which he was given the allowance of £100 per year. 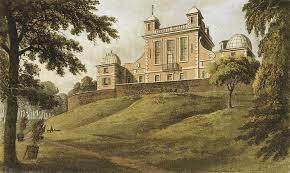 He also set up the Royal Observatory at Greenwich, shown below. 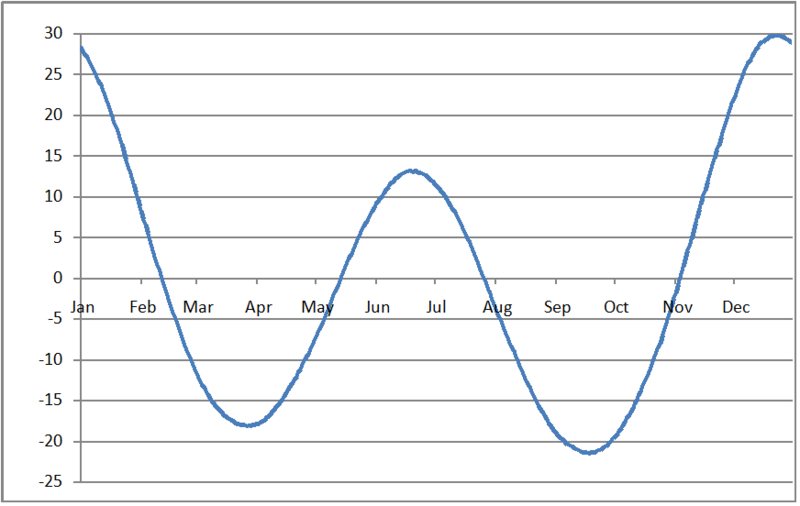 The diagram below shows how the equation of time varies throughout the year. 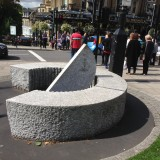 from 25 December to 15 Apr and 13 June to 1 September the sundial would be slow. Why does the length of a solar day vary ? The reason why the length of the solar day varies is due to two different factors. The fact that the Earth moves in an elliptical (oval-shaped) orbit around the Sun and its speed varies, being faster in earlier January, when it is closer to the Sun and slower in early July, when it is further away. The fact that the axis of the Earth’s rotation is tilted. The combination of these two factors gives the equation of time shown in the picture above. For more details on how these two factors work together to vary the length of the day, see my post September 18 the Shortest Day. What about the southern hemisphere ? In the southern hemisphere the longest day is around December 21. What happens is that the Sun starts rising later before December 21, but it doesn’t start getting dark earlier in the evening until well after December 21. 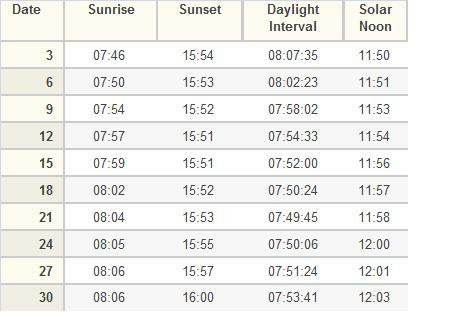 This is illustrated in the table below, which shows the sunrise and sunset times for December for Wellington in New Zealand, which lies at a latitude of roughly 41 degrees South. I hope you have enjoyed this post. To find out more about the Science Geek’s blog, click here or on the Science Geek Home link at the top of this page. The Earth’s rotation is slowing down, causing the length of a day to get gradually longer. In the year 1900 a mean solar day was 24 hours long. Now, in the early 21st century, a mean solar day is actually 24 hours 0.002 seconds long. To prevent the day we measure using accurate clocks from drifting away from the “natural day” we need to add an second called a leap second ever few years. For more information on this see my post: The Days are Getting Longer. For most places in the world the Sun isn’t at its highest in the sky at 12 noon. This is because, rather than each area having its own local time, the world is divided into time zones, which are normally a whole number of hours ahead of or behind Greenwich Mean Time (GMT). For example, Manchester, where Mrs Geek and I live, is roughly 2.5 degrees West of Greenwich, but is on the same time zone. Because it is further West, the Sun rises and sets later than it does in Greenwich. From late Oct to late March, in Manchester the Sun is at its highest in the sky at 12:10 pm (on average) compared to 12-noon at Greenwich. At the end of March the UK puts its clocks forward by one hour, so from late March to late October the Sun will be (on average) at its highest in the sky at 1:10 pm in Manchester. I like how you always take time with your post and then publish such a good one! I’m always glad to see this early December date. I know that spring is just around the corner. HA! I’m just fooling myself. Our most bitter weather is still a month away here in the midwest. It’s ok. It makes us strong. Extremely interesting! I actually live in Wellington NZ and the lag in daylight movement vs clock has always puzzled me. This piece is a great way of explaining something that isn’t known by many people – nice work! Interesting fact. I didn’t know that! Wow, had no idea about all this. Thanks for this detailed explanation. Your approach to this topic was perfect. Justified.